When you start looking for Diesel exhaust tips or performance exhaust systems you will find quite a bit of information on the Gibson performance They have a huge line of diesel exhaust tips that just clamp on (without a clamp!). 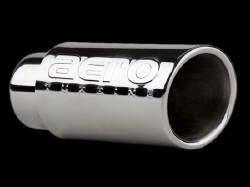 The T 304 stainless steel will never rust and is the perfect way to finish the "performance exhaust" look. What good is it to have the finest performance exhaust in the world if you have that nasty looking stock pipe sticking out for everyone to see. If you're looking for different exhaust pipe tips then let me tell you about the new "Aeroturbine" exhaust tips. First a quick note on their performance exhaust muffler. With their patented technology, the Aeroturbine performance mufflers are the first exhaust products to actually accelerate the flow of exhaust through the exhaust system and away from the engine. No other muffler can, by itself, claim the performance benefits that the Aeroturbine can. Before Aeroturbine, dyno technicians would tell you that the best performance is achieved with no muffler at all. Aeroturbine changed all that ... now they think different. Aeroturbine also has stainless exhaust tips. Truck and auto exhaust tips are becoming more and more popular and you now have a wide range of medium quality to high quality tips to choose from. Bully markets a line of tips that is on the cheap end but I think this is an area you should go for the quality. A cheap stainless on the tip of your exhaust needs to be of the highest quality. Consider spending $50 instead of $19.95. You'll be glad you did. Stay away from chrome altogether. The constant heat will cause it to chip and flake ... and then RUST! Whether its a Dodge, Ford, Chevy, Toyota or Nissan I don't think you can go wrong with an exhaust tip. I tricked my Dodge with about $5000 worth of truck accessories and it wasn't "finished" until I added the stainless exhaust tip. With the stainless rocker panels and the stainless fender trim it just didn't look "done" until the exhaust was added. Diesel exhaust are usually quite large but there are a variety of styles available for the larger pipes. Gibson has some with "flames" and "stars". Rectangular and turn down styles gives your truck that clean custom look. These just screw on so don't go thinking "installation hassle". It only takes a couple of minutes and you just need a screwdriver. No rocket science here. Just a smitgent of elbow grease.